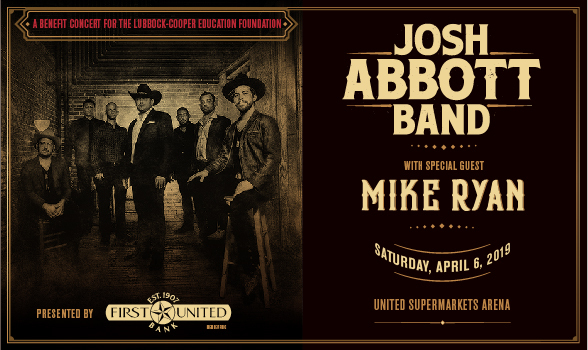 The Lubbock-Cooper Education Foundation is pleased to host the Josh Abbott Band featuring special guest Mike Ryan this Saturday, April 6 at the United Supermarkets Arena. This annual benefit concert is the Foundation’s premier fundraising event, providing hundreds of thousands of dollars in scholarships and grants to the students and teachers of Lubbock-Cooper ISD. This event is generously sponsored by dozens of businesses and community leaders throughout Lubbock and West Texas. Planning for this large fundraising event begins approximately one year in advance with the procurement of a date that best works for all parties involved at the time. Due to recent, very exciting circumstances outside of the control of event planners, the concert and the NCAA Men’s National Semifinal Game 2 featuring Texas Tech and Michigan State are set to take place simultaneously. The concert will proceed as scheduled, with doors opening to the general public at 7:00 p.m. The community is invited to join the Lubbock-Cooper Education Foundation in a celebration of great music for a great cause. Tickets are available at selectaseatlubbock.com. The Texas Tech Red Raider men’s basketball team has the full support of the Lubbock-Cooper Education Foundation Board, and we eagerly anticipate the ringing of the Victory Bells! Tickets are on sale NOW for An Evening with Josh Abbott Band and special guest Mike Ryan on April 6 at United Supermarkets Arena! Presented by the Lubbock-Cooper Education Foundation and First United Bank, the concert is the premier fundraising event supporting scholarships for graduating Lubbock-Cooper seniors and innovative grants for Lubbock-Cooper educators! Don’t miss an evening of entertainment in support of Pirate education…purchase your tickets today!